That first shot is a prize winning shot. Very informative post on Salim Ali. Lovely post. DI, I loved this post more because I have been a fan of Dr. Ali since childhood and was an avid bird watcher too. I was a member of Nature Club in school so had done lot of research back then. That was such a artistic way of doing the tag DI!! to be honest with you, I knew abt Ornithology but did not know abt Dr Salim Ali…it was very informative and also very nice pics! To be honest with you too, I didn't know about Salim Ali either. I came to know when I was searching for this post on ornithology! And thanks once again for Tagging me! I was also thrilled to know about him when making this post. Wow! The first photo is amazing but saddening. 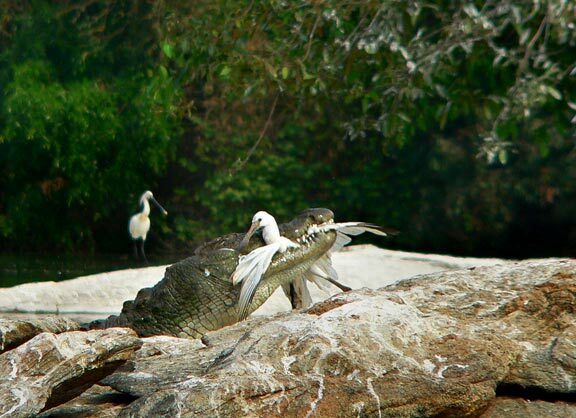 Wish I could pry open the crocodiles jaws and release the bird. Nice to know so much about Dr. Ali!! Yeah, it is saddening indeed. But it is the nature of the crocodile to hunt and eat. I thought more than twice before putting that picture here, but I thought it was a great shot for a photographer. Amazing Photo post :), I will admit not much of a bird person, though the kingfisher looks good, (good I hope its a kingfisher). Thanks for sharing Info on Dr. Salim Ali. 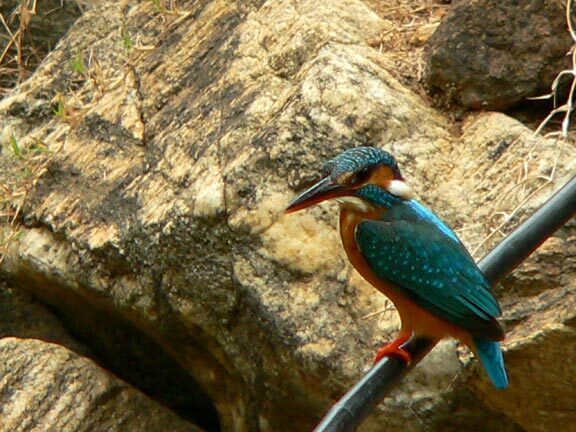 I was also told that it is a kingfisher. So, I guess it should be! But among the other kingfishers that I have seen, this one is more lively! Thanks, Smitha. Actually I forgot to pass on the tags (As usual!). So, why don't you take up the tag and do it on your site? I love your name here..
that was a deeper study and review about the field of ornithology. Awesome clicks by your friend. Thanks for sharing. I always like fellow bloggers who like my online identity (For the reason, go to About page!). I wanted to initially write only on Ornithology but when I saw such a significant contribution to this field by an Indian, I decided to represent it to all. I have Dr Salim's book. It was in my father's collection and I loved to read about the various birds and leafed through the book for the beautiful pictures. That's great! There is a special charm to the hardcover books. Even though you have the whole Wikipedia available on the internet, the old encyclopedia is still charming! Awesome pictures! The kingfisher looks gorgeous! And thanks for all the information about Dr Salim Ali. Yes, the kingfisher looks colourful! I guess Jags has done a great job. It is his passion to come up with great clicks. Congrats Jags. Fabulous pics, DI! If you haven't seen "Winged Migration" (a really great documentary), then you must. I will definitely see it, thanks for the recommendation! Thanks Rahul, I was also glad to know about him by making this post! I also did a post on birds with pictures- amateur obviously… about how we found a baby sparrow, and didn't know how to care for it! You were lucky, once I wanted to make a house lizard as a pet (Anyway it was roaming around my room only). So I was searching in the internet for what to feed lizards. On seeing what to feed them, I gave up the idea! while salim ali & orinthology dont mean much to me, for i understand nothing of it, i read about his meeting a man I was researching….and wrote about that meeting. it will come up soon on my site.. Waiting for that… BTW, I too didn't know about Salim Ali before writing this post. hy……….dr. salim is a great person.